This is the stylish Lula Camus who came to London from France seventeen years ago and stayed. “I think there is a certain freedom of expression here that you don’t get in my country,” she admitted to me with an enigmatic smile, while reclining nonchalantly in front of a sign that read “Dandelions Please.” Years ago, Lula worked in the Savonerie in the Spitalfields Market before the rebuilding and now she has returned. 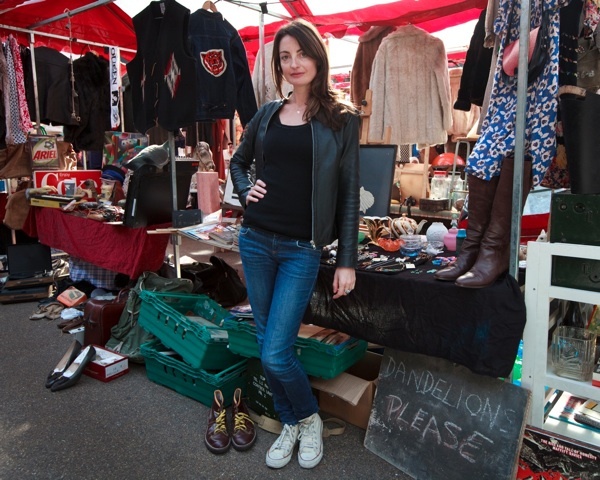 “I decided to give it a go in the Antiques Market and this is my second week, but I’m still deciding whether to make it a full time job.” she confessed, rolling her dark eyes in equivocation and looking at me questioningly. I have my fingers crossed for Lula’s return. This is Hazel & Keith Townsend, a couple who both travel for a living as flight attendants. 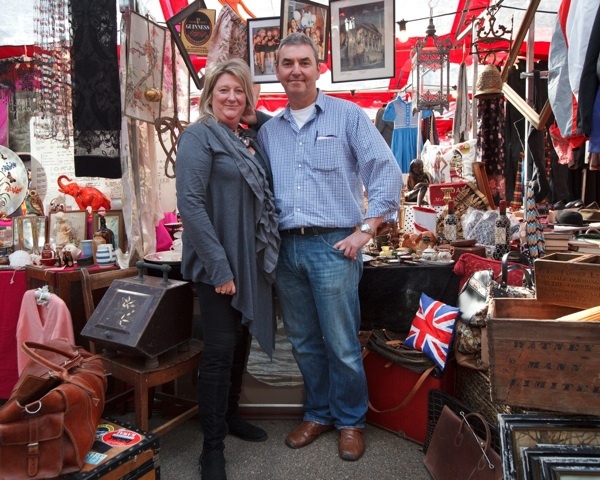 They flit in and out of the Spitalfields Market like migratory birds, selling the excess of unusual artefacts they collect in their globetrotting. “We get up at four thirty to come up from Sussex,” Hazel informed me while Keith ferried boxes from the car. “He does all the fetching and carrying, and helps me a lot,” she added in whisper, once he was out of earshot. “It’s all very new and there’s a novelty element but it’s still good fun.” announced Keith enthusiastically when he returned, “sometimes, we buy new things but the collection is going down.” And they exchanged a private smile of happy contentment. I wish Hazel & Keith safe flights. This is the charming Charlotte Marionneau & her handsome helper Sam. Charlotte came to London from Paris sixteen years ago and met her fellow ex-patriot Lula Camus for the first time on the day this photo was taken. 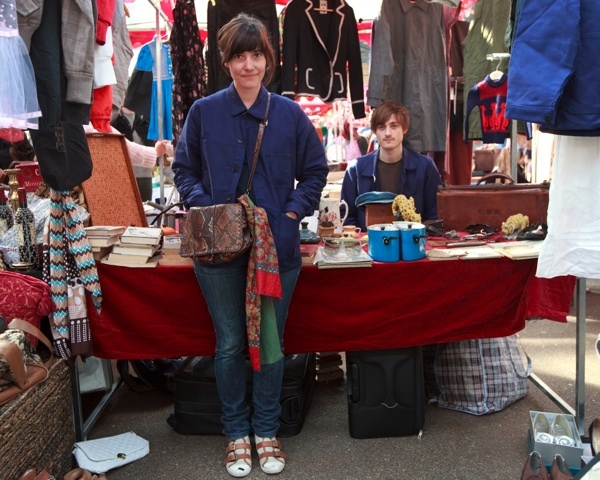 “People are doers here,” she informed me with a respectful nod, “whereas in France, they just talk about it.” Charlotte began trading in Portobello fifteen years ago and started here in Spitalfields last year, selling an eclectic mix. A musician by profession, Charlotte has just completed her second album Theodorus Rex with her band Le Volume Courbe and, when not on the market, she works at Lucky 7, the record shop in Stoke Newington. So, for Charlotte, life is either music or markets. I hope the album is a big success. This is Jany Thomas & Marcin Cybukski enjoying a cuddle. 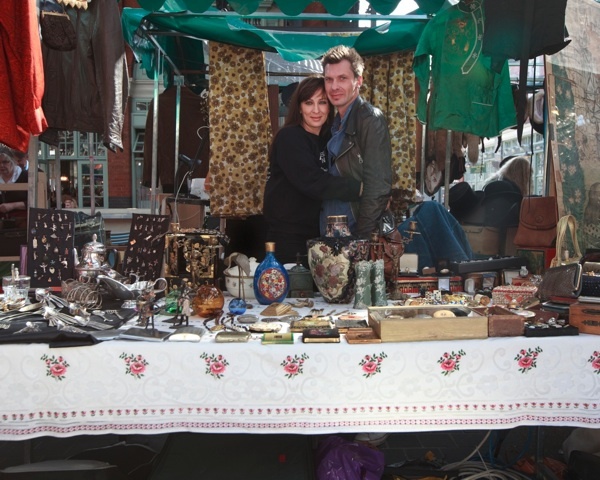 “I grew up in markets, my mum traded at the stables in Camden and under the bridge in Portobello,” explained Jany, “I started last year, because I am an artist and I wanted to work for myself.” In fact, Jany & Marcin’s romance blossomed on the market and now they are engaged to be married. “I’ve always had a passion for antiques,” Marcin revealed, gesturing to the magnificent display upon the table,”and this is happened when we got together.” Next month, both commence a Fine Art Degree at the University of Middlesex and they plan to marry afterwards. I wish Jany & Marcin happiness in their marriage.